jump off plane, unpack, load the washing, fill the fridge aaaand open laptop…straight into it right! Well after three weeks, over 1000 mails, and 10 meetings later I have finally found a moment to sit down, and share my travels with you! Aaaah the beauty that is Phuket..what a colourful place, and I don’t just mean the sunsets! I mean the happy, crazy, fun loving people that make Phuket a destination like no other. From boat rides and lazy beach days, to forest walks, zip lining and quad biking, you can pretty much fulfill just about every desire there…and if you are looking for the crazy…believe me you will find it in heaps and bounds on Bangla Road…I wont say more on this, you kind of just have to experience it for yourself..defs not for children though, I have to just put it out there! For those of you who are well frequented with Bangla road in Patong, you know what I mean lol! We did sooo much I don’t think I can cover it all in one blog post without it turning into a book, so I am going to share my 6 key highlights with you instead. Firstly, I absolutely have to rave about the hotel we stayed at – The Sis Kata Hotel, a brand new boutique hotel that sits atop a steep incline just across from Kata beach, making for spectacular views of the island. Oh and the infinity pool that extends out into the ocean was eeeeverything!!! I felt so at peace to spend time immersed in the therapeutic arms of water, looking out into the endless expanse of the ocean. I highly recommend the SIS Kata if you are looking for a classy, high-end hotel experience. The staff are incredibly friendly and helpful, the food is delicious and the ambiance is perfect for young couples and kid friendly too! 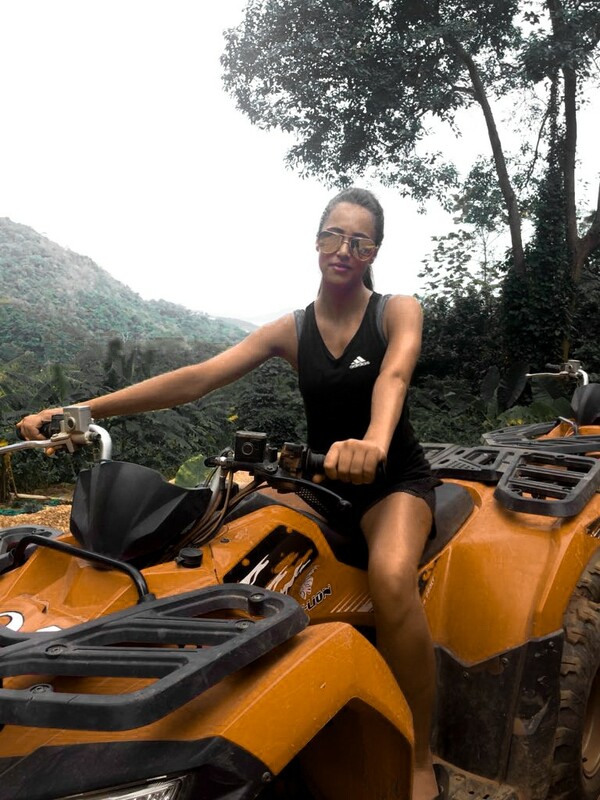 If you are in for a bit of an adrenaline rush then you have to try out quad biking in the forests of Phuket! Just a 15 minute scooter ride from our hotel, this place caters to all sorts! What I love about Phuket is that the entire island is completely focused on tourism and so everyone is so accommodating! If you have a bit of skill on the quad bike then the guides will give you a whirlwind experience (wow do they have skills!! ), and if you are a beginner or prefer to take thing slow, you can take it easy, learn at your own pace and take in the gorgeous views. What I absolutely love about Thailand is that you can live it up without breaking your bank account. Everything is so affordable there, including the luxuries. Most of the beach clubs in Phuket are located near Kamala beach which is around 45 minutes from Kata beach – a much quieter part of the island, but I would say probably also the most beautiful! There are a variety of clubs to choose from here from Café Del Mar and Catch Beach Club, to Dream and HQ beach club. Each beach club has their own style and personal flare, with a beautiful pool area, sun lounges, bar area and restaurant all enveloped with the tasteful tunes of world class djs, drummers and saxophonists. Sundays are usually popular for all day seafood buffet, which I have to say are out of this world! From lobster and oysters to flame grilled prawns and salmon, salads, veggies, pasta, pizza…desserts for days…and and and! In sum..freaking delicious!! Post feast, you can then make your way to your designated sun loungers, enjoy cocktails by the pool or beach and be entertained by world class DJs. Friday and Saturday evenings usually turn into proper club vibe and feature fabulous themes, and international DJs from all over the world! From day to night, these beach clubs offer everything. All the beach clubs are kid friendly too during the day, so perfect for fun family day out! Something for everyone! If you are in Phuket, you absolutely have to try Ban Rim Pa restaurant outside of Patong, for the best traditional Thai food experience! If you are in the mood for Italian, you have to give Gastone’s in Kata Beach a try – fresh, authentic and run by an Italian owner! If you are closer to the Patong area, Napoli is the best of the best! I especially loved their melanzane parmigiana – low carb too! YUM! And if you are in the mood for dessert, well then its all about the fried ice-cream and Nutella crepes – you can find these street food delights pretty much everywhere you go! – an absolute must have!! For healthier options, the fresh coconut water, and watermelon smoothies are my favourite!! Massage spas are a dime a dozen in Phuket, so if you are feeling a little tense and need to wind down, you can enjoy a massage of your choice for the lowest price you will ever pay for a massage…ever! (seriously!) We went pretty much everyday, so I think I got my fix for the year haha! I do have to recommend thought, that you be very specific about where you go as some of the places are a little dodge – you will be able to tell though from the look and feel of the place, whether or not it is more legit. For those of you looking to work on your wellness, there are many yoga studios in and around the Island of Phuket. If you have a more advanced practice and like to yoga on your own, then beach yoga by sunset is an absolute must!! And if you are really looking to push your fitness boundaries, then you absolutely have to try Muay Thai Boxing at AKA Muay Thai Gym in Rawai - all the top fighters train here, and I can honestly say, you wont get a better workout than this!! And it such fun too! One on one trainers are available to get your skills going! So whether you feel like adventuring, and partying, or feasting, shopping, and relaxing, Phuket has it all – really and truly everything for everyone! Who else has been to Phuket? I would love to hear about your most memorable experiences there, an what you recommend? Share your experience in the comments below.